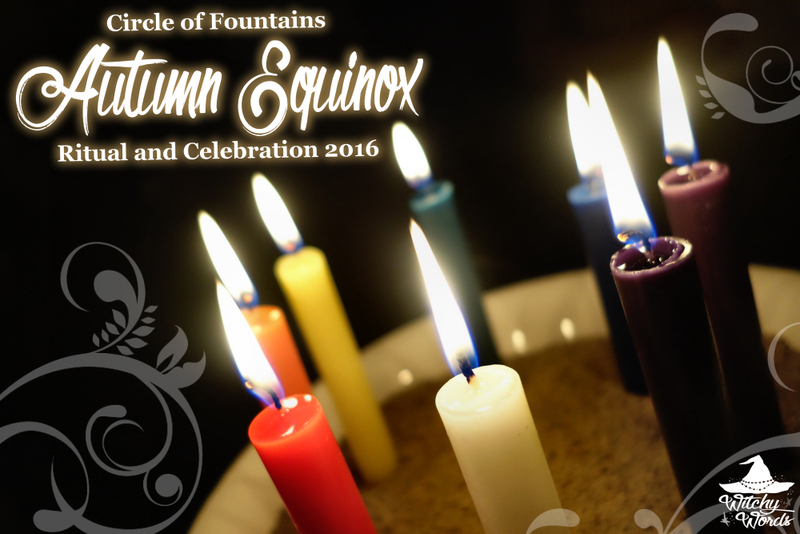 For Circle of Fountains 2015 Autumn Equinox Ritual, click here! 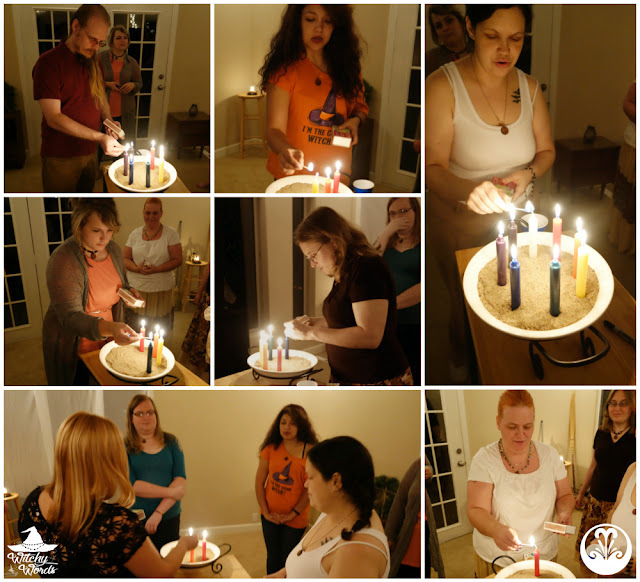 This year's Autumn Equinox ritual was held by Abby! Each sabbat, a different Circle of Fountains member writes and leads the ritual. 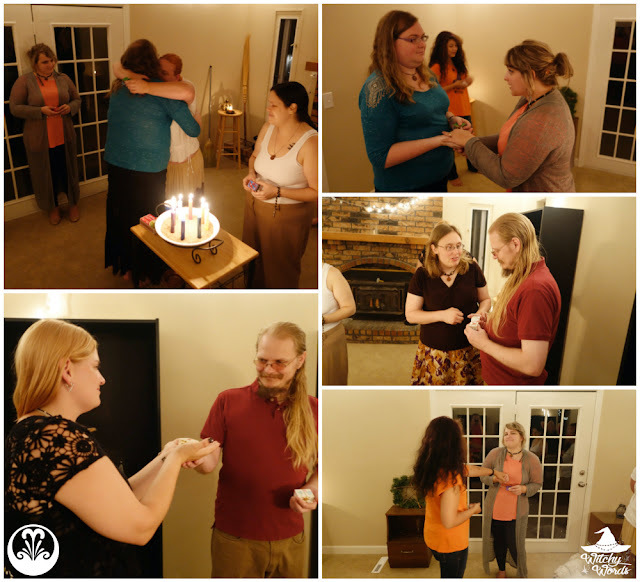 Each of our circlemates has a different belief system or practice and often incorporates that into their celebration. 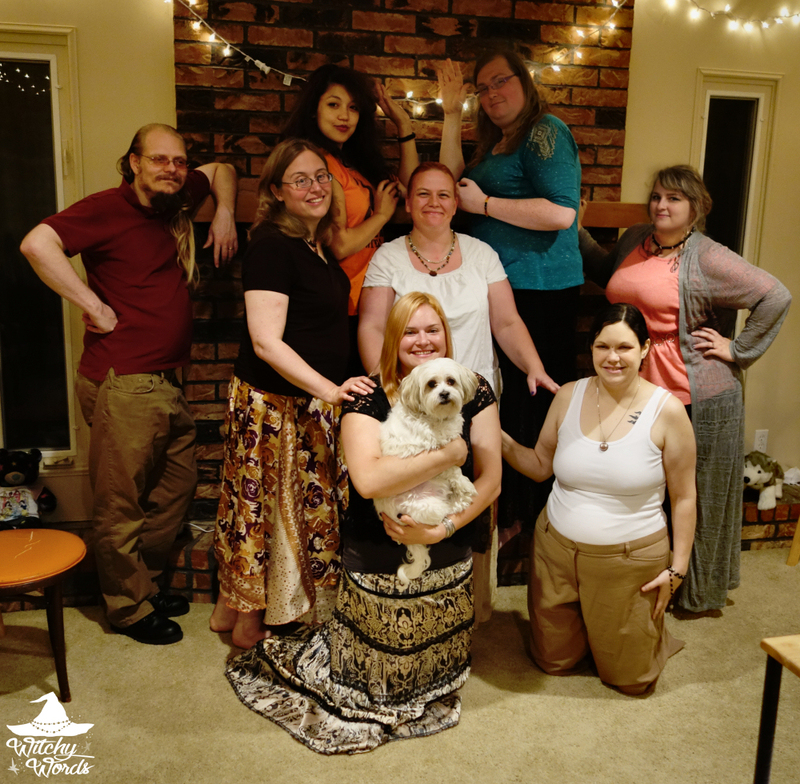 Abby wrote previously about the journey she took finding herself as a hereditary witch. You can check out that article here. Abby confessed to me prior to the ritual that what she had planned took an immense amount of trust, that this ritual was something she did not feel comfortable doing with other people until she met us. Our celebration began with our standard potluck. Abby stressed how frustrated she was at the stereotype of the autumn equinox being the "Witch's Thanksgiving." In order to steer away from that theme, she asked each of us to bring our favorite dishes. 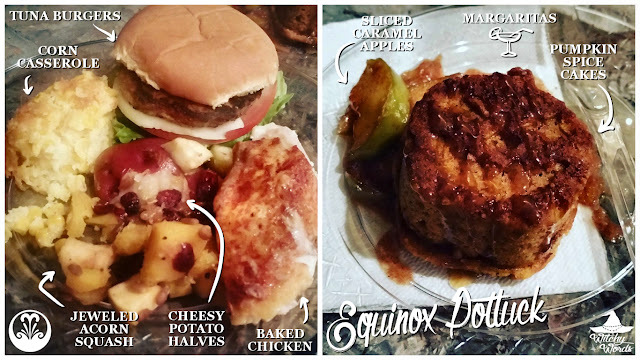 While the potluck steal leaned a little seasonal due to market availability, we still had an incredibly variety, from tuna burgers to corn casserole to jeweled acorn squash and more. Once we finished eating, it was on to the craft! Abby's craft was ritual relevant. Thank you to Zeus for being a fantastic display table. One of the key elements of ritual involved these small wooden boxes. 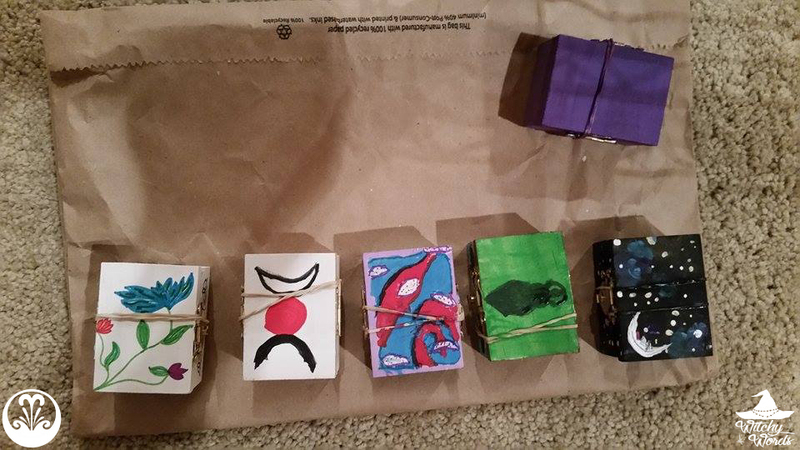 Abby had each member decorate a box however they saw fit. Some decorated it in terms of the season, some about themselves and some about the group. Here's just a few of the finalized boxes! Once the boxes were completed, Abby began ritual by having me sweep out the circle area with a new broom starting at north. She then created purified water using salt and had Amy sprinkle the water about the room also starting at north. Finally, Abby asked that we hold hands once-by-one starting in the northern quarter to officially open the circle. Once the circle was open, we called upon the elements, deities, spirits and other such entities we felt necessary to enter the space. I'm sure you've already noticed but my ritual space was intentionally left packed for this ritual. 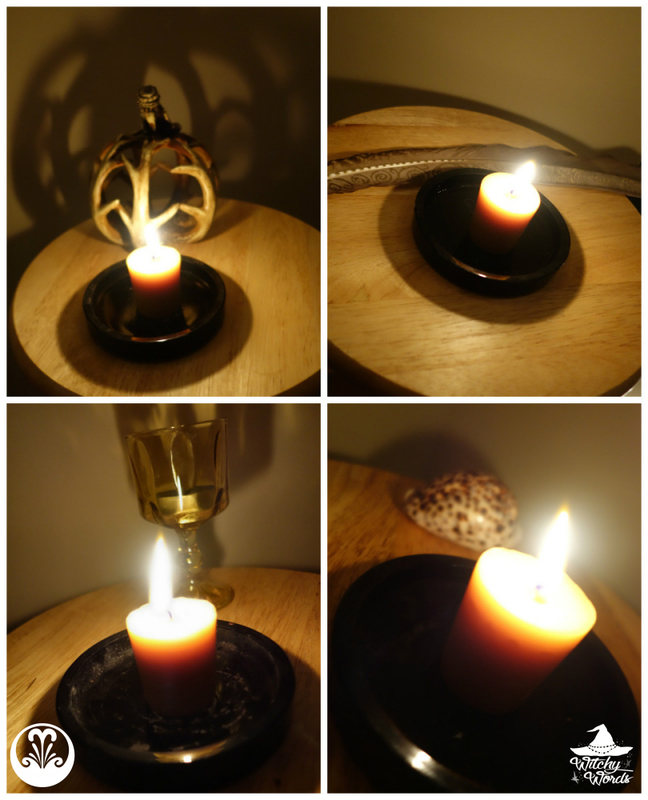 Not only was the equinox ritual shortly after my husband and I moved into our new home, but Abby insisted on a back to basics, stripped down ritual. 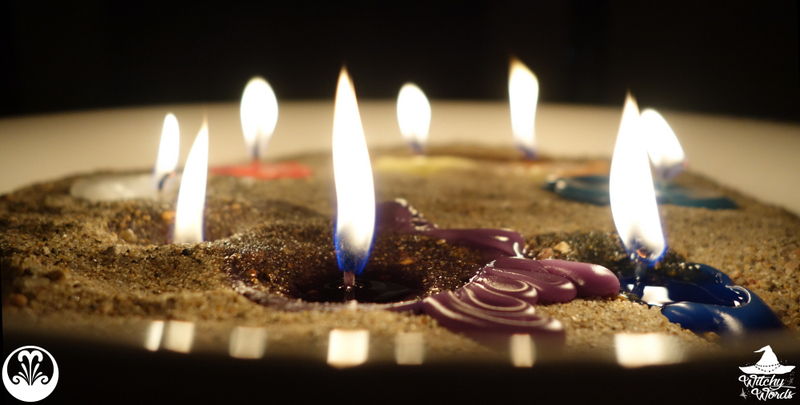 Having the ritual space stripped of decorations and with only the most simple of quarters seemed appropriate for this ritual. 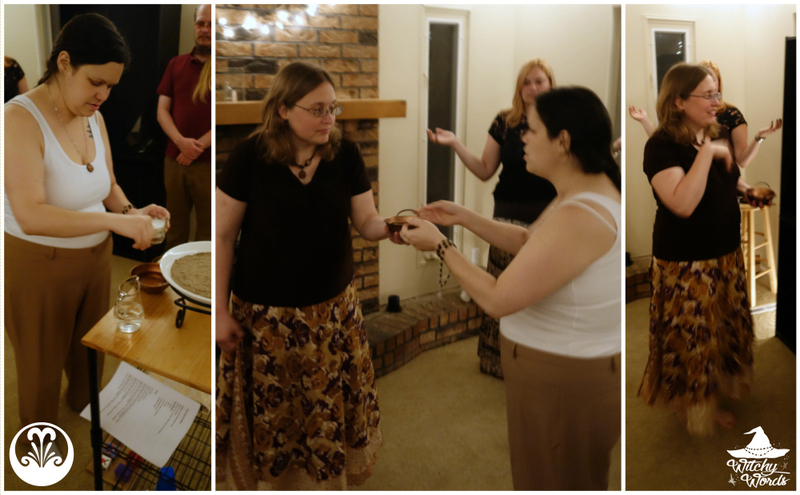 With the circle open and entities called, we began ritual! Abby explained the importance of gratitude and balance, emphasized by the equal night and day of the equinox. She then unwrapped a collection of candles. 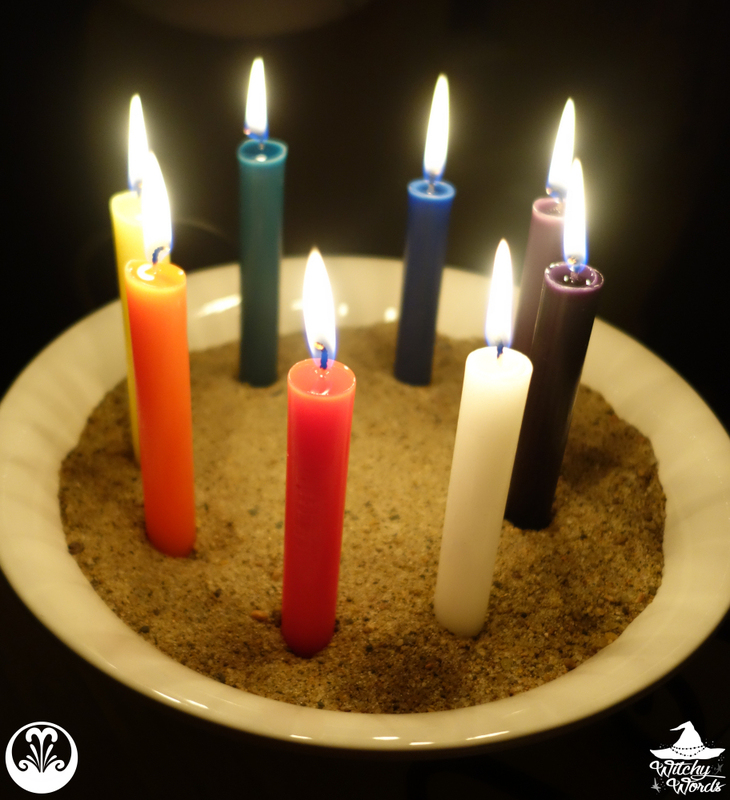 As she called out the color of each candle, we were asked to step forward and bless that candle with something important to us. Once that candle was blessed, we were given the corresponding box - not necessarily the one we painted but the one printed with the same color as the candle we chose - and were told to write what we blessed our candle with on the bottom. 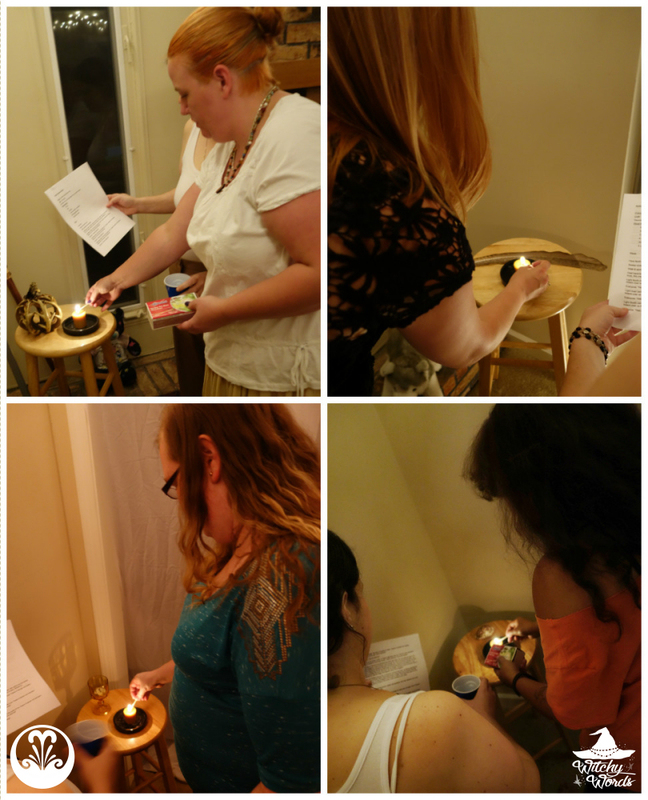 Once all the candles were lit, we were then asked to charge not just the box but the contents of that box in our hands with our candle blessing. Abby then told us to gift that box to the person we felt needed that blessing the most. Only when everyone had gifted their charged and blessed box away were we allowed to open them. 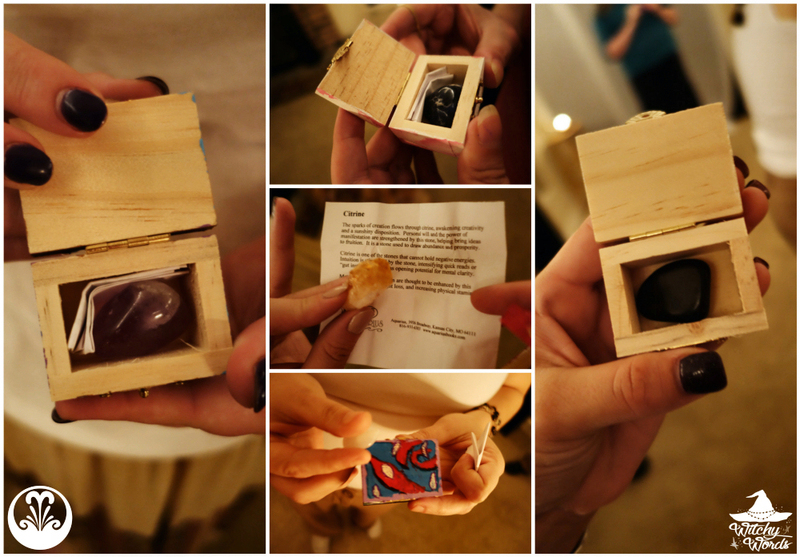 Inside each box was a stone with a correspondence chart. 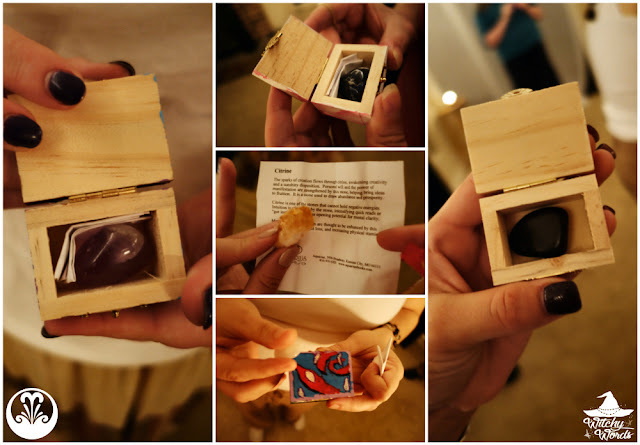 That stone inside has been charged with the intention of the bottom of the box, giving it an added focus for our needs! This means that each box was painted by one person. Then gifted by the person who blessed and charged it to yet another person for their use! And the ritual was complete! We celebrated a bit more with the margaritas Abby made and then called it a night. The candles took the better part of the night to burn out, but had the watchful eye of a familiar at all times guiding them. 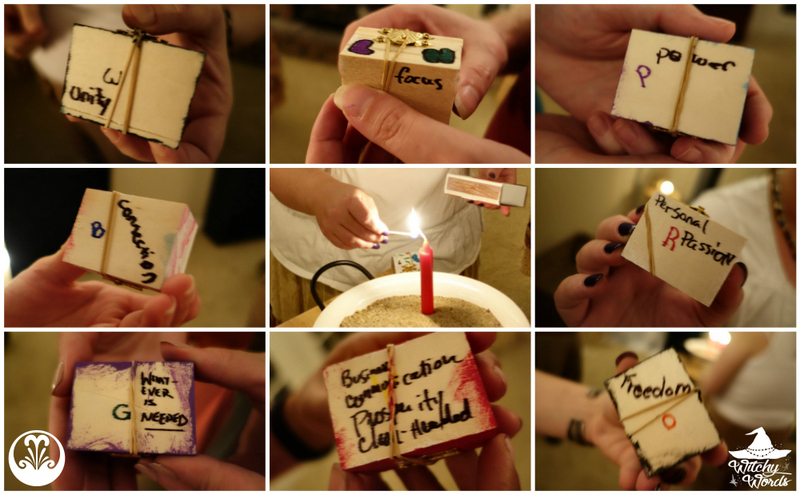 And there you have it: Abby's amazing trust-based gifting ritual for the equinox! What a wonderful way to celebrate the unity of our circle and the gratitude of the season. 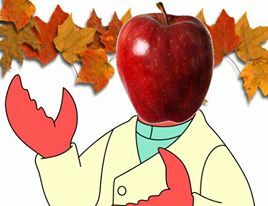 From my circle to yours, happy Autumn Equinox! Welcome to the darker half of the year. Also, here's to hopefully the last Mabon where I have literally just moved before ritual. What a beautiful trust based ritual! Really well done by Abby! I'll pass your comments along! Thank you so much! Yes, another awesome ritual! I love the idea of the gift boxes. Did you paint the one with the crescent moon and stars? They all look so nice! And your familiars are so helpful. On an unrelated note, I'm pretty sure I found one of your graphics on Pinterest with your name taken off and someone else's name added. I 'll add a link to it later tonight or tomorrow so you can make sure. Thank you so much! My box didn't get a photo for whatever reason. I did some watercolor-style teal flowers with pink clouds. The one you're referencing is Kolika's. If you run across that graphic again, let me know! I can file a DMCA against it and get it removed. Thank you for being on the lookout, Liz! I appreciate it!